As per the provisions of Section 56 of Companies Act, 2013 a company shall not register a transfer of shares of, the company, unless a proper transfer deed in Form SH.4 as given in Rule 11 of Companies (Share Capital & Debentures) Rules 2014 duly stamped and executed by or on behalf of the transferor and by or on behalf of the transferee and specifying the name, address and occupation, if any, of the transferee, has been delivered to the company, along with the certificate relating to the shares, or if no such certificate is in existence, along with the letter of allotment of the shares. An instrument of transfer of shares i.e. Form SH.4 with the date of its execution specified thereon shall be delivered to the company within sixty (60) days from the date of such execution by or on behalf of the transferor and by or on behalf of the transferee. 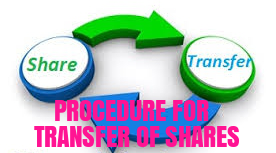 1.On receiving the application Form SH-4 for transfer or transmission of shares check that the form is duly stamped and executed by the transferor and the transferee. 2.In case the application is made by transferor alone and relates to partly paid up shares, give notice to the transferee in Form No. SH-5. 3.If within two weeks from the receipt of notice, ‘No objection’ is not received by the company from the transferee, than the company will not register the transfer. 4.If transfer of instrument has been lost or not delivered to the company within specified time than such transfer shall be registered by the company on such terms as the board may think fit. 5.In the next scheduled board meeting, the board resolution shall be passed regarding the transfer and transmission of shares. 6.On approval by the board, endorsement shall be made in the name of the transferee on the back side of the share certificate while in case where the company needs to split its shares into two or more new share certificates, endorsement shall be made in the name of the transferee in new share certificate and original share certificates shall be retained by the company itself and shall be marked cancelled on the face of the certificate. 7.The Share Certificates shall be delivered within a period of one month from the date of receipt of instrument of transfer.